Upbound on the Detroit River. The "Algobyay" finally budged off the jagged shoals that had trapped it for more than two days, just minutes before salvage crews were to give up for the night at 10 p.m., July 6. The ship is now floating, and the next task is to move the ballast water and cargo weight — which had been moved to lighten the bow — back to their original positions. After being freed, the ship will travel to Prescott to unload its cargo and undergo a visual inspection. It then will proceed to St. Catharines, Ontario, for repairs. Effordts are under way to free the "Algobay" that ran aground on a shoal in the St. Lawrence River in northern New York. Crews aboard the ship are shifting ballast water to refloat the ship so two tug boats can help free it. The ship should be refloated later July 6, 2010. 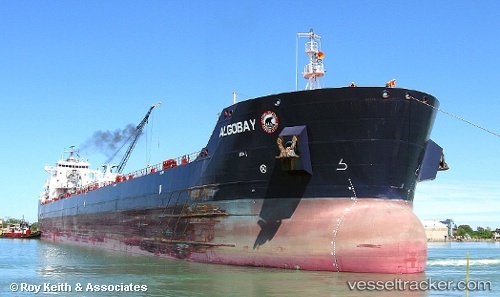 The Algobay was headed to Prescott, Ontario when it ran aground July 4 morning in Chippewa Bay in the St. Lawrence County town of Hammond, 100 miles northeast of Syracuse. The ship is carrying Canadian corn. There is damage to its hull, but officials say no pollution was reported from the grounding. No one was injured. The St. Lawrence Seaway Development Corp. and the Coast Guard are investigating.